Your mission: cyber-espionage. Your time: running out fast. Immerse yourself in Infiltration. Donald Vaccarino’s latest game release is set in the futuristic Android universe and pits players against each other as cyber-thieves in a race to infiltrate CyberSolutions; a secure android production facility. Each player must move quickly and stealthily through the complex and steal as many data files as they can then escape the facility before the authorities arrive. Every turn, players must decide to press onward, avoiding guards and alarms or turn back to escape with as much data as possible as the Mercs close in. Players begin the game in the entrance room with a hand of four basic Action cards and four random Item cards. The four basic actions consist of Advance (moving forward one room), Retreat, (moving backward one room) Interface, (accessing a unique card effect in the current room) and Download or Extract (taking Date File tokens in the current room). A game Round consists of four phases: The Selection phase, where players simultaneously and secretly choose only one of these four basic actions, or one item to play. (Item cards provide special effects that range from extra movement, playing more actions, and delaying the plans of other players.) Once chosen, the Resolution Phase occurs and players reveal and resolve the one action or item in player order. After all players have chosen and resolved their actions or items, the NPC Phase takes place, where encountered NPCs may move and act within the facility. (that’s usually bad news). Finally, during the Security Phase, the first player rolls a d6 and advances the Security Tracker dial by the result. The tracker also has an “Alarm level” – a number from 1-7 – which can also be advanced by game effects. The die roll is added to the Alarm level and advances the game toward its inevitable conclusion: when the dial reaches 99, the Mercs arrive arresting anyone still found in the facility and ending their game. The CyberSolutions facility (game board) is actually represented by 13 room cards that are randomly chosen from 32 total cards, and placed in two diagonal rows with secret room in the middle. Players will choose to move card by card (room by room) deeper into the facility in search of Data Files (DF) or backwards to escape the facility. 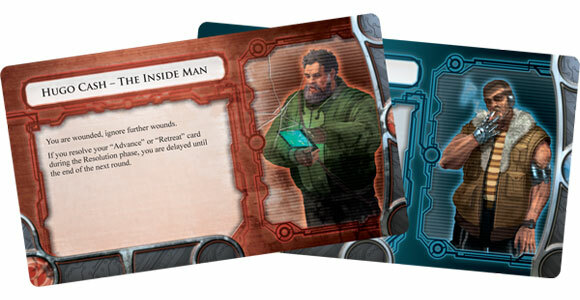 The room cards provide the random attributes and effects that may help or hinder the players’ search for data, and eventual escape. Chief among these room attributes are the number of Data File tokens in the room (which turn out to be victory points at the end of the game). The room cards may also have Lab Workers and Tech Locks in them, (represented by small yellow or red tokens respectively) that if removed, release more Data Files into the room for the players to download. Each room also has a purple Interface token. Players that “Interface” can utilize that room’s Interface effect immediately. However, players may usually only interface with each room once per game. Agents that escape the facility count the value of their DF tokens. The player with the highest value wins. Those that don’t escape in time are eliminated. As one would expect from Fantasy Flight Games, the components and art for the game are of excellent quality, and immerses players in the world of Android almost immediately. However, the too small, almost hobbit-sized action and item cards are difficult to manipulate and read. The text on them is annoyingly small, and with extra space in the box for storage, one wonders why the cards were not printed in a standard size. It’s a shame for the artwork on the item cards as well – as they would be gorgeous if only they were larger. Infiltration can easily be taught in 10 minutes. The goal of the game is simple to grasp and even a game for new players will only take 45 minutes. Although the game is rated for players 14 and older, there is nothing shocking or too mature about this game. Parents can sit down with children as young as 10 and enjoy this game together. There is nothing in Infiltration that lends itself to a social or party atmosphere. Players are out for themselves, with player interaction being focused in the game and in a limited manner. There is a high level of random elements in Infiltration. So players will find it a more tactical game rather than strategic. Not really a game for strategy gamers. 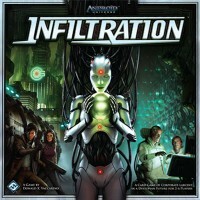 Infiltration plays quickly, is affordable and offers great replayability. Most enjoyably – a countdown creates a sense of urgency as the game progresses. Casual gamers will enjoy this light, immersive and tense adventure. The push-your-luck nature of this game does allow for some very intense plays, in addition to great replay value. But its enjoyment really depends on whether a gamer enjoys this style of game that depends so much on random elements. If so, break in and start downloading! Infiltration doesn’t offer the challenge of mechanics, multi-turn planning or player interaction that a Power Gamer will appreciate. Game play is fast, simple and intense. Infiltration provides a perfect, specific game experience: immersion. The game is light on mechanics and steeped in theme. This may be different than what one might expect from designer Donald X. Vaccarino. In fact, it’s the perfect marriage of the immersive theme and randomness that makes Infiltration shine. It can be easy to be critical of the use of randomness in games. Agreed; an excess of chance can make a game so unpredictable as to make it unplayable. But these random elements are critical in creating the feeling of tension and excitement that the theme demands. There are controllable elements: visible activated game effects, four standard player actions – but it is how they are combined with the unpredictable elements that make Infiltration so irresistible and enjoyable. At first glance, some game aspects may give players pause. The Data File (DF) Tokens (victory points) are randomized and are valued between one and three points. A player could download 10 DF tokens, escape from the facility and have a score anywhere between 10 to 30 points. But the distribution of the 117 DF tokens (58 -1 point, 41 -2 point and 18 – 3 point) allows for a stable scoring percentage from game to game. This brilliantly links the theme to the mechanics. (Real agents downloading data may not really know the true value of their theft until the data is analyzed). So, in effect, the game has a “hidden victory point track.” Opponents can see how many DF tokens another player has, but have no idea of the value. Very cool. Also, player order can be key when accessing the rooms’ Interface effect and access to the DF Tokens. Player may feel a bit limited, especially in games with 4-6 players. But there are a fair number of ways to alter what seems like an unalterable movement/action order – usually item cards that break the rigidity of the rules. There are so many random occurrences and nasty surprises around every corner – all the while the Proximity dial is climbing and escape seems impossible. All this seems like uncontrollable mayhem – but is it satisfying? Well, this game really evokes the question: why do we play games? No matter who we are, each of us plays the game that gives us the most enjoyment; be that a near theme-less worker-placement game or an immersive role-playing game; from a game as strategic as chess to a game as random as Yahtzee; or this – a light fast, intense, thematic game filled with random occurrences. Each game feels like its own epic story of cyber-espionage and recounting each game is as fun as playing the game itself. If this sounds like the sort of adventure that excites you, immerse yourself in Infiltration. It’s a blast. With its nearly infinite replayability and tense push-your-luck action, Infiltration is perfect for fans of fast-paced card games, the rich dystopian world of Android, or the work of celebrated designer Donald X. Vaccarino. This game is set to be released the second quarter of 2012. A look at the game's components and how to play. Infiltration is a game full of pros and cons to me. Being as such it has truly thrown my feelings in a twist about this enigmatic game. I love you, I love you not. The game play is simple which is a plus to me. You are a thief breaking into a building to download and steal data and make it out without getting caught. The building is made up of cards that represent different rooms of the building. You control your thief’s moves by selecting an action along with the other players then playing your action card in turn order. The actions are Advance or Retreat to an adjacent room, Download file (VP’s) or Interface with a room’s special ability. Each player also has a set of special cards they can play for bonus abilities. This is a fun mechanic that adds to the strategy of the game. Because all players are selecting there actions at one time and then playing them in order you don’t know what the other players are doing. You have to make assumptions about where they are going and when they are going to try to score data/victory points. At the end of each round a die is rolled and that number is added to the alarm. In order to finish the game you must make it out of the building before the alarm meets 99. There are a number of things that I really like and that drew me into this game, but as I played it more and more there are different things that I also really didn’t like and found myself adjusting a few of the rules that I felt left holes in the game. •	The theme of the game is great. It builds great that you are searching through a building looking for something but knowing that you only have a little bit of time before you are busted on the alarm goes off. You sense the suspense and it builds into the strategy of the game. •	The look of the game is also fantastic, but it’s a FF game so it is expected. One thing I will add is that it has “Finger Cards” where you can fit about 12 of them into the palm of your hand. I wouldn’t mind paying $5 more per game for a larger card. •	The game play is great for a quick fix, and even repeat, and simple enough for anyone to learn. •	There are a few rules that I feel leave a hole in the game that I think would actually improve the theme. For instance, it only makes since, with many bank heist movies, that you should be able to escape from the roof! This would draw more people further into the game and add to the theme. •	I don’t care for the one and done function of the special cards and it seems difficult to acquire more. If the right rooms are not in the mix you are kind of screwed. •	I would also prefer to have unique character abilities for the thief you use. It could have simply been created to put a special card on the player card as a special ability but they just worked it into the rules as something you could do. It seems like they were thinking about it but didn’t commit for some reason. I can find myself picking out what game I want to play and the struggle for strategy vs. theme will come into play. What do you want? Great theme? This is your game! Lots of strategy? You may want to pull something else off the shelf because there is a good amount of chance. This will play into my overall score for a game since I grade on what I would want to play out of all the games I have graded. Overall, I think it discourages me to get a game from a great publisher that has a lot of excitement from it and play a few times and see holes in it. But I guess its not that big of a deal and the theme and suspense of the game do make up for most house rules in play. I’m happy I have this good, but not great game. It has a place on my shelf, but I would encourage you to play if first. There will often be other games I would prefer to play. PS. Check out the tips section for some rules to make improvements. Today, we are going to discuss a little game known as Infiltration. Infiltration is a Push-Your-Luck game for 2-6 players set in the Android world (with obvious Phillip K. **** and Blade Runner roots). Each player takes one of several varied “characters” and infiltrates a corporate research facility to steal as many Data Files (DF tokens) as possible. Each turn time runs down on the “proximity dial”… you must get what you can, and get out before security gets to you. Time is running out! The game area is basically two rows of cards (6 cards each) that represent the first and second floor of the building you are infiltrating. Floors are revealed the first time a player lands on the card. Some cards have events that occur immediately. All cards have something to earn or do when you move to them. Selection Phase: Each person selects an action card from their hand (move, break locks, gather tokens, etc) and sets it aside. Resolution Phase: On your turn, you reveal your card and resolve your action card in order from whoever is starting player this particular round. If you are last… your play may have already been foiled. NPC Phase: The Non-Player Cards are activated and do whatever their card says they do. NPCs show up on certain floor cards and do various harmy stuffs. Security Phase: The first player for that round rolls a die and move the Proximity Dial up. Once the dial gets to 99, security shows up, and anyone still inside the building is toast! The game includes a fair amount of luck, but unlike other push-your-luck games, strategy and tactics play a roll. How far you go into the building has a lot to do with your experience playing the game (spoiler: the second floor has two ways out of the building). You might also decide to stay on the first floor…gather as many DF tokens as you can, and get out before anyone can screw you. Did I say “screw?” Yes, this game can be very backstabby! There are action cards you can get that allow you to move people into danger, obstruct their exit, or jump the proximity dial one way or the other. A devious soul might raise the proximity dial just before he/she escapes… trapping you with security. The person who makes it out with the most DF tokens wins! Of course, you have to actually get out. There are not many games my game group says, “let’s play again, and again, and again.” Yes, it’s random, but there are enough tactical decisions to keep most gamers happy. Going in with a strategy is also useful… but you may have to change based on events… keeping things interesting. I don’t always like games like this, but Infiltration is very well done. Other Infiltration pluses, are the fact that it is very easy to learn and teach. The FFG rulebook is surprisingly small for this one. It also supports 6 players… which everyone knows is a good thing when you have a slightly larger group. IMO this game could probably be played as a one player game (haven’t done it yet), but it works quite well from 2-6. Itplays in about 45 minutes once you get the hang of it. Granny highly recommends this game. I picked Infiltration up from my FLGS the day I heard of its release and got on to learning it before my weekly weekend game night in hopes of having the rules nailed down to facilitate an easy inaugural session. Well my weekly game night didn’t happen and in a way I’m happy I had the extra time to spend getting the rules and game play down before pulling it out to my game group. My first impression of Infiltration after opening the box was that it seemed similar to Elder Sign which I’m a huge fan of but after playing through a few solo games I realized that it is comparable but different in many ways. The frantic feeling of a countdown is there but you need an exit strategy and co-op play is not going to happen here. The locations or rooms that make up the modular facility all activate something that will affect your strategy as the proximity counter gets closer to putting the facility on full Lock-down rendering your data thieving useless and ending the game. My first play-through left me thinking “Is that all?” Just going through the rules and playing solo didn’t give me the feeling of being a data thieving operative competing against others because I was in control of all the characters but after a 2 player game my experience changed 100 percent! The objective of the game is simple. Collect (steal) as much data as you can and escape the facility with the data before the Security Force invades and takes you down. Obviously, not knowing your opponents (other operatives) strategy adds a huge element to the game that drives the competitiveness up and helps with immersion and the impression that you are actually sneaking around this building and hacking their computers all the while planning your exit strategy and avoiding the NPC’s. The production is slick as always with FFG and the game is not table size hungry. The rules are straight forwardish and after a few plays most things make sense. There are still a few things that we’ve scratched are heads about such as… does the first player change after every round? We changed the first player each round assuming that was how we were supposed to play. Maybe it was just us who couldn’t find a solid answer to this. Probably the biggest disappointment was that all the Operative characters are pretty much the same. No special abilities!?!? Kind of makes the characters very “gray”. I was hoping for variety in this aspect but the game works fine the way it is. All in all my impression of Infiltration is a good one and I can see this game appealing to a broad audience because of its theme, ease of play and almost zero set-up time. Much like Elder Sign I can see this being played often with my group because of the for-mentioned reasons and I’m also a huge Sci-Fi fan so this is a very welcome title. I look forward to seeing how FFG supports Infiltration in the way of expansions. More Operatives with special abilities and more secret rooms would be a huge bonus. The basic premise of the game is to infiltrate a building, and steal data from the various rooms, and escape before the alarm goes off and you are captured by security. It employs a bit of a press your luck mechanic, as you need to make your way room to room through the building, and then run back out the way you came in. Each turn consists of a simultaneous action selection performed by placing an action card face down. Once all players have selected an action, the actions are carried out in turn order. This inserts a bit of strategy into the game, as you need to think ahead to guess if your opponents will be downloading the limited number of datachips in the room before your turn comes around. If you are in a room with 3 other players and 3 chips, chances are you won’t get one if they are going before you, so you might want to move to the next room instead. Each round ends by rolling a die to advance the alarm tracker. The alarm tracker goes up to 99, and once it hits 99, the game is over. If you are still in the building, you lose, only those who escape get to compare victory points. You need to pay attention to how quickly the dial is moving, and where you are in the building to plan your escape. You can also sometimes use a bit of strategy to intentionally crank the alarm up faster to try to strand your fellow players in the building. There are a few NPC’s and special equipment cards that let you do things like attack other players, or fight NPC’s. Some of the NPC’s also have special abilities like raising the alarm level. The game really fails at two players. The rules say to play two players by each player taking two agents, and then manage separate card hands for each one. This is obnoxious. I have tried the game with just two agents, and it is playable, but there is very little player interaction. The random layout of the rooms is exciting, and discovery of new rooms makes the game fun. The equipment cards add a bit of variety, and sometimes you get a really fun card that lets you pull off a great move and score some data. The data chips you score are hidden from other players, and have a value of 1-3, so nobody really knows what your score is until the end. This means even if you decide to force the alarm up and leave early, you can’t know if you have enough points to win. The alarm dial is a great mechanic, and adds urgency. The equipment and action cards are those tiny finger cards. Bleah. The alarm dial seems to move too quickly, and it’s rare that you really get to interact with the upper floor much. This is too bad, because the second floor cards are really fun. The two-player play two agents mechanic is obnoxious. Overall, this is a fun game to play with a group of about 4 players. It’s a relatively quick game, and sets up fast. I think it makes a good medium-time filler game. The player interaction is fun, and you don’t get the feeling that it’s a ***************** game. However, the game seems to be a little short. You always end with the feeling that there was a lot more to do on the upper floors, but you never got to see it. I think it’s a game that could probably be rescued with a few house rules to fix things up, but in the end, that is a slightly flawed game. In Infiltration, you try your hand at data hacking, breaking into a major corporation’s production facility. Your goal is to steal more data than your fellow hackers, and to get out before the cops (Mercs) arrive. 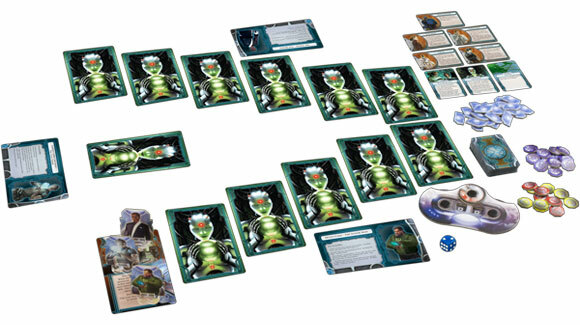 Infiltration sees up to six players enter a facility, portrayed by cards in a V shape. Each card, representing different types of rooms with various abilities, starts face down. As the players move through the facility, the cards will be turned up, often offering data for the taking. Each round, played over four phases (Selection, Resolution, NPC, and Security), will give each player the ability to move around, play items, download data, and stress out about whether to continue moving forward, or make their way for the exit. Why run for the exit, especially when there may be rooms left to explore? Infiltration includes a ‘timer’, which will count up throughout the game, though not necessarily at a standard rate. Once the timer hits 99, the game ends with anyone still in the facility arrested, losing the game. The player that has managed to download the most data and make it out before the Mercs arrive wins. I really enjoy push you luck games, and was excited to try Infiltration. It does a good job of giving tension in your decisions to continue on, or start trying to flee. It gives people that may not have the best luck collecting data a chance to win by getting out while the greedy amass their fortunes. I find this a very good thing, as most of my plays of Infiltration are lopsided in who collects the most data. There seems to be a large benefit to getting ahead of the rest of the group, especially since many rooms have only one or two shots to gain data. Additionally, some items feel greatly overpowered, and most items you’ll see are randomly assigned before the game. The other issue I generally see when playing, especially for new players, is that by the time you decide you need to leave, it may be too late to actually escape. While I like this timing aspect to the game, the end can come very quickly, sometimes leaving half of the rooms unexplored. There is something slightly unsatisfying about playing through a game and knowing you never saw much of what existed. This also compounds the problem with an early leader. If you need to catch up in data, you’ll need to push beyond where they went, making it less likely you’ll escape. With those points said, I still enjoy pulling out the game, and find it plays quickly enough that we’ll normally get two or more plays in. The ability to play a second game immediately after the first helps alleviate the problem of a new player having no idea how quickly the timer can run out. Infiltration doesn’t strike me as a game with across the board appeal (contrast this with Donald X. Vaccarino’s more well-known Dominion and Kingdom Builder which each attract a broad range of gamers). It is easy enough for most Family gamers, and the playtime is right. I’ve found Casual gamers enjoy it, but I don’t see it being overly Social, and would be hesitant to recommend it for that group. Avid gamers will likely enjoy the time restriction and push your luck element, but I doubt there is enough there for Power or Strategy gamers to really sink their teeth into and want to play more than once. I’m glad I have Infiltration, but it doesn’t get played as often as Incan Gold or Can’t Stop, my two favorite push your luck games. The latter are each a bit easier to teach/learn, and give a better feeling that you are in charge of your fate, less often encountering a run-away leader issue. I’d recommend giving Infiltration a try, but expect to find an accessory game, not something you’re likely to build an evening around. How many times has this happened to you? You’re living your life in the digital age, trying to do your thing, when The Man oppressed you with his corporate dogma and puts you behind the 8-ball. So what do you do? Well, you get even, of course. By stealing the corporation’s nasty little secrets. That’s what Infiltration is about, in a nutshell. You play the game as one of any number of cyber-hackers seeking to steal their way into a high-security building to get as much data as they can before they are discovered and arrested. Of course, just because the cyber-hackers are joined in a cause, doesn’t mean that they are joined as a group; they are out for themselves, and if someone else has to take take the fall for their crimes, well…too bad, so sad. The game is basically played in a stairladder format; the playing field is comprised of facedown room cards that make up a first floor and a second floor as the room cards are revealed. The hackers will be exploring these rooms, one at a time, trying to gather data chips from the rooms before the swat teams arrive. There is a threat meter provided that starts at 0; every round, the person who goes first for the turn rolls a six-sided die and adds the value to the threat meter. Once the meter reaches 99, it’s game over, and anyone who is still in the building loses automatically. You win the game by escaping the building, and having the most value of data chips among the surviving players. Advance: Moves the character to the next room in the chain. Retreat: Moves you back one room. Interface: Activates a room’s special function (if it has one). Download: Allows a player to collect data chips from a room (if any). The item cards are all varied, but can be substituted in place of playing an action card, and allow a character to a variety of special abilities, like using more than one action card a turn, moving more than one room a turn, or cracking tech locks in certain rooms. Every turn, players select one card to play that turn, and place the card face down, where it is eventually revealed by everyone at the same time. The first person for that turn resolves their card first, then the next, until everyone has resolved. During that time, as rooms are revealed to the players, events will happen, such as npcs (non-player characters) appearing, secret rooms being revealed, and alarms going off. The latter is especially bad, as each time the die is rolled for threat, the current alarm value is added to that roll. Ultimately, Infiltration is a game of risk management. How far do you press your luck in delving into the complex before beating a retreat? When should you turn back? Can you count on the other players not throwing you to the wolves? Each turn, the pressure increases, making every decision critical in the late game. It gets intense, and that is the Mark of a great game, one that keeps you involved and interested from beginning to end. Euro style games are some of my favorite, but even I have to admit, some times they can seem a little dry. Too much is guaranteed and/or known. We know how many turns we’re getting, what our opponents can and cannot do, how many cards in the deck, etc. In a way, this is part of their appeal, as it isn’t always possible to formulate a good strategy if there’s too much randomness in a game. Infiltration, however, has a wonderful sense of urgency, and imminent danger, without having to rely too much on randomness for it. After 1-2 games, players will generally know what can and cannot come out in a given game, but it’s the ‘press your luck’ style gameplay, combined with limited resources (in this case, data to steal) that makes every turn seem urgent, and every decision pivotal. The only drawbacks are the game can get really dull if you have to spend too many turns retreating, and I wish there were more rooms (although the relatively low price tag makes this forgivable). With gameplay similar to Incan Gold and a short playtime, this is a great game to play while waiting for others to arrive, or just to kill 40 minutes. Also, I love that they’re making new games for the Android universe. I absolutely ADORED the theme and components for Android, marred only by the fact that it’s nearly unplayable, combined with ridiculous game length. I’m really glad to see the theme, story, and characters put in better games like this one. I can’t wait for new expansions! A fast moving and fun game. The game has a built in timer in terms of rounds, because the cops are on their way! It’s get in, take all Data Files that you can, and get out! If you push your luck and are trapped you lose half. The characters are fun, weapons and items are cool, and the board is built out randomly at the start of the game and includes a secret room, which may or may not be accessible. Any game with randomly built board and a fog of war effect along with it, is generally tons of fun in my book! There’s trashtalk, backstabbing, and underhanded thievery at each step paired with a “For the common good” if a killer NPC policeman is unleashed in the facility. A fun game that you can squeeze in a couple of easy in one night or one while you’re waiting for the late comers in the group to start the feature of the evening. I was able to play this game finally at Gen Con. There is a definite quick vibe to the game as you need to plan ahead as you try to avoid the authorities. You go from room to room searching for data files trying to avoid security guards and other hired by the corporation. You need to break locks open at time to obtain that data. Data are these small chits that have a number on the back. Don’t peek as this is part of the end game. The issue is your opponents are also trying to gain data and may steal the data after you broke the lock. In order to accomplish this you need to play cards that can assist you or hinder your opponents. Make the right moves, play the right cards and you may be able to escape. Don’t escape the building you lose. The player with the most data that escaped wins. For the first game it was quite enjoyable. All four players were in the building when the counter started to really accelerate. None of the other players were near the exit nor did the second exit pop up. It was the last turn as the counter was going to go past 99 and we all would have been caught. I had a card that would allow me to be the only person to escape thus I would win the game. But as luck would have another player had a card that moved the counter past 99 and we all lost the game. Jerk move if you ask me but that is the play of the game. I enjoyed this game and I would be willing to play again. But I do not think it is one I would add to my collection. Fell in love with the android theme when it first came out, so really looked forward to this game. Very different style of game, but it was FAST, and hectic, and so simple and straight forward. It took no time at all to work out how to play, and then we just zipped through it. As always, FF games look great and this is no exception. Add a Review for "Infiltration"